OSWEGO, NY – Oswego County Court Judge Walter Hafner has postponed the sentencing of Joyce Malone until next month. 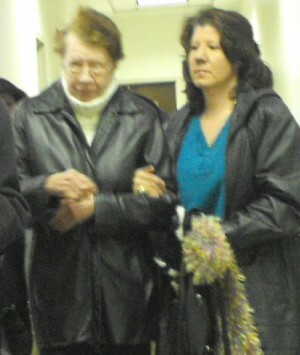 Joyce Malone, left, is assisted out of Oswego County Court today by her daughter, Brenda Eddy. Malone, who was convicted Jan. 24 in the shooting death of her husband, appeared in court today (March 7) with her attorney, James Eby. Several family members and friends all were present. The defense attorney explained that his client is undergoing treatment for an inoperable cancer. Malone, 70, is battling stage four lung cancer. She is now scheduled to return to court on April 8. Hafner and Eby traded barbs throughout the proceedings. The judge read from a pre-sentence report done by the probation department and referred to a letter from Malone’s son, Joseph. “You want to start yelling at the court, Mr. Eby?” the judge shot back. If there were “any credible shred of evidence” to support those accusations, Eby said he would assume that the assistant district attorney would have brought it up at trial. “I take great exception to the court making findings based upon this unsworn, unverified statement of Joseph Malone Jr., which appear to me to be in the form of a drunken rambling!” the defense attorney said. “This is the fourth time that you’ve yelled at this court, Mr. Eby throughout this trial. I’ll make a note of that. I find Mr. Malone’s rambling, as you call it, very well put together, it’s all typed. It doesn’t appear to be absurd at all,” Hafner replied. The judge said what is absurd to him is the defense-called psychologist Norman Lesswing never interviewed the sheriff’s investigator who spent much time with Joyce Malone following the shooting and he never talked with the son, either. It was a rambling letter that the son had addressed to the probation department, Eby said outside the courtroom. After the verdict came in, Eby asked his client to get a complete health examination. In the course of that it was revealed that she has cancer in the lungs, it has moved into the lymph nodes and her brain. Since the cancer was detected, Malone has been under the care of a team of doctors, Eby said. The cancer, doctors said, was “extremely aggressive,” Eby added. She needs radiation therapy daily for several weeks and chemo therapy for several months, he said. Could his client die in prison? “From what I understand of stage four (the most advanced stage), it is not a good diagnosis,” Eby acquiesced. Malone remains free on a $100,000 bail bond.